Just Jingle: Breathtaking Butterflies New Release Blog Hop! Gallery Idol Note of the Day: If you haven't checked out my super fun Gallery Idol Round 3 Cards I NEED your vote! You can use the widget below to vote and you can see my cards in detail in THIS POST! Thank you SO MUCH for your votes!!! And now onto today's blog hop! If you came from Katie's blog you are almost done! Skipping Stones Design has a BRAND NEW release and it is a GORGEOUS ONE! We are celebrating with a blog hop!!! We also have a brand new sketch challenge out and one random person who plays along with the sketch and links up to the Skipping Stones Design post will win a set of FREE STAMPS! YAY! 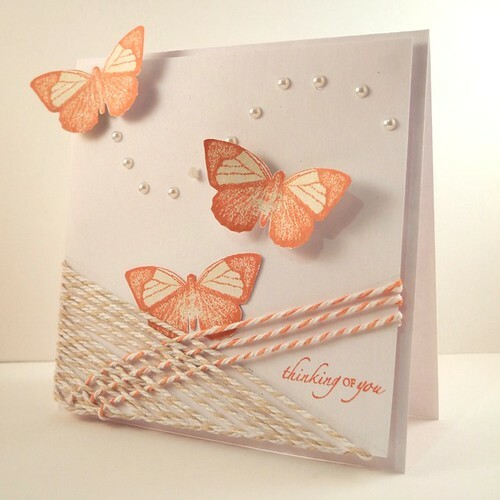 Here is the card I created with the BRAND NEW BEAUTIFUL stamps - Breathtaking Butterflies AND the sketch for this week! I used twine from The Twinery to create the bottom portion of the card. I just love how pretty it looks woven like that! A few pearls mark the path of one of the butterflies, adding just that little something to complete the card. Here is the full hop list! I'm the last stop, so if you just found the hop through me, hop on back to Skipping Stones Design to start at the beginning! Jingle Out! Don't forget to vote! THANK YOU!!!! gorgeous butterflies and way to rock the twine! OMG, Jenn! This is just amazing! Love the flight trail done in pearls and how creative to use twine for the "pocket." You go, girl! No wonder you are in the Top 15!!! Love how you used the twine on this one, and the pearls for the butterfly trail. So pretty! That card is just GORGEOUS!!! Girl you kill me with your creativity! LOve the twine as the overlapped element! beautiful card and this is why you are in the Idol finals~love it!!!! Gorgeous card!! Love the butterflies!! Beautiful! Love the peaches and creams! So pretty Jenn! Love the twine treatment and how you used the bling. FABULOUSness! Love all of your cards- love the Cowboy/girl and love these butterflies and the twine! Just went and voted for you too- best of luck!!! So pretty and a nice twist on the sketch! Very inventive way to use twine! Oh, I adore that twine weaving! That looks sooo cool! :) The butterflies and pearls are perfect for this sweet card. Totally gorgeous and that weaving! OMG-what a cool idea!! I am going to try that soon with all this twine I have and never use. 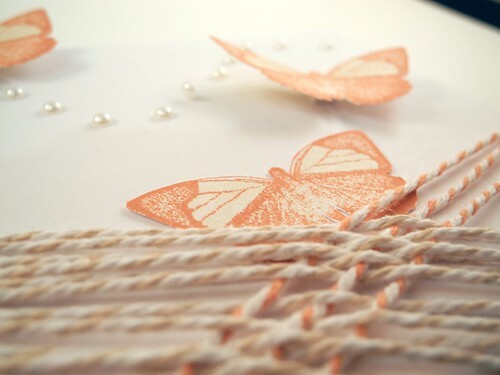 Love how you wove the twine at the bottom of the card...very creative. Congrats on going to round 3 or Gallery Idol. Beautiful butterflies and oh my gosh that twine!!! Congrats on the Idol placement! And this card is wonderful- what a great way to use twine! Such a clever idea with the twine, and your card is beautiful! How pretty!! Love the twine weaving you did at the bottom and the pearl "flight path" is the perfect finishing touch. SUPER way to use that twine!! Love the net effect! Great idea with the textured twines! And congrats on making the TAWS team! FABULOUS, FANTASTIC. LOVE THE SOFT PEACH COLOR. LOVE THE TEXTURE CREATED BY THE TWINE! Gorgeous card, Jennifer! Cograts on your GI honors! Also, I had to laugh when I saw your desk-that photo could've been take in my scraproom! Organization is totally over-rated! LOL thanks for sharing! gorgeous butterflies love them in that color! beautiful! love how you did the twine!